15th Ward Democrats: Win a Shepard Fairey Obama Hope Poster! 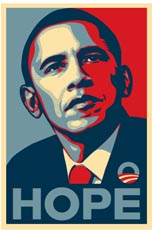 Win a Shepard Fairey Obama Hope Poster! As a token of our appreciation, for every shift you work on behalf of the 15th Ward Democrats and the Obama Campaign for Change 15th Ward Team, you will get one raffle entry. The more you help, the more chances to win!